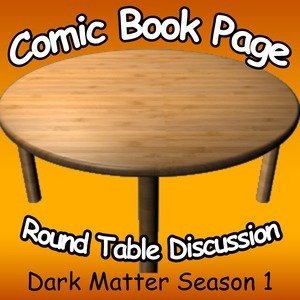 John, of ComicBookPage, and Kay, and PopArtsPlace, have a spoiler filled discuss about the first season of Dark Matter. This entry was posted in Podcast, Podcasts, PopArtsPlace, Review, Television and tagged #DarkMatter, @AlexMallariJr, @BaronDestructo, @dark_matterTV, @jodellemicah, @marcbendavid, @Mel13Oneil, @ranthonylemke, @therogercross, @ZoiePalmer, Alex Mallari Jr, Anthony Lemke, Comics, Dark Horse, Dark Matter, Garry Brown, Jodelle Micah, Joseph Mallozzi, Marc BenDavid, Melissa O'Neil, Paul Mullie, Roger Cross, Ryan Hill, Space, Stargate, SyFy, Zoie Palmer on August 1, 2017 by Kay. 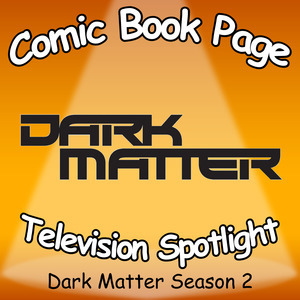 John Mayo, of ComicBookPage, and Kay Kellam, of PopArtsPlace, have a spoiler filled discuss about the first season of Dark Matter and the comic book miniseries it was based on published by Dark Horse in 2012 . This entry was posted in Podcast, Podcasts, PopArtsPlace, Review, Television and tagged #DarkMatter, @AlexMallariJr, @BaronDestructo, @dark_matterTV, @jodellemicah, @marcbendavid, @Mel13Oneil, @ranthonylemke, @therogercross, @ZoiePalmer, Alex Mallari Jr, Comics, Dark Horse, Dark Matter, Garry Brown, Jodelle Micah, Joseph Mallozzi, Marc BenDavid, Melissa O'Neil, Paul Mullie, Roger Cross, Ryan Hill, Space, Stargate, SyFy, Zoie Palmer on July 29, 2017 by Kay. John Mayo, of ComicBookPage, and Kay Kellam, of PopArtsPlace, discuss the third and fourth seasons of Continuum. This podcast contains spoilers for the entire series, which stars Roger Cross (currently on Dark Matter) and Rachel Nichols. All four seasons of Continuum are currently available for streaming on Netflix. This entry was posted in Podcast, Podcasts, PopArtsPlace, Review, Television and tagged Alec Sadler, Alias, Andromeda, Betty Robertson, Brian Markinson, Carlos Fonnegra, Conclusion, Continuum, Curtis Chen, Dark Matter, Edouard Kagame, Emily, Ending, Erik Knudsen, First Wave, Inspector Dillon, Jasmine Garza, Jennifer Spence, Julian Randol, Kiera Cameron, Lexa Doig, Liber8, Liberate, Lucas Ingram, Luvia Petersen, Magda Apanowicz, Matthew Kellog, Omari Newton, Rachel Nichols, Richard Harmon, Roger R. Cross, Series Finale, Simon Barry, Sonya Valentine, Space, Stargate, Stephen Lobo, SyFy, Terry Chen, Theseus, Tony Amendola, Traveler, Travis Verta, Victor Webster on December 7, 2015 by Kay. This entry was posted in Podcast, Podcasts, PopArtsPlace, Review, Television and tagged #DarkMatter, @AlexMallariJr, @BaronDestructo, @dark_matterTV, @jodellemicah, @marcbendavid, @Mel13Oneil, @ranthonylemke, @therogercross, @ZoiePalmer, Alex Mallari Jr, Comics, Dark Horse, Dark Matter, Garry Brown, Jodelle Micah, Joseph Mallozzi, Marc BenDavid, Melissa O'Neil, Paul Mullie, Roger Cross, Ryan Hill, Space, Stargate, SyFy, Zoie Palmer on December 4, 2015 by Kay.